Hydrangeas are flowering shrubs that are easy to grow and can provide color in the garden from mid-summer through fall. They are used as specimen plants and in shrub borders. The flowers of some species can be dried and used in flower arranging and crafts. The name comes from the Greek “hydra,” meaning “water” and “angeon,” meaning “vessel,” referring to the plant’s preference for moisture and to the shape of the seed capsule. Hydrangeas were first introduced by Sir Joseph Banks from a Chinese garden in 1739. The birth flower of June, they’re almost always blooming then. Bigleaf Hydrangea (Hydrangea macrophylla) is the most commonly planted kind, and the one with the largest and most show-stopping blooms. Although it is not always possible, purchase a hydrangea while it is in bloom. This allows one to see how the plant will bloom. Whenever possible, plant in spring (when frost danger has past), early summer or fall. Don’t plant in early spring when frosts are still possible. Don’t plant a hydrangea during the hottest part of the summer. If it must be done, be on hand to give it some TLC and to keep it well watered. Hydrangeas bloom from early spring through summer. Hydrangeas prefer a site with filtered to partial sun. They generally thrive if planted facing east. Full sun is tolerated in coastal areas. In hotter inland areas, they do best with morning sun and afternoon shade. Make sure the planting location also has good drainage. For ground planting, dig a hole three times the size of the container. Mix up to 50% with native soil and acidic amendment, like camellia and azalea mix. Plant in the hole with the top of the root ball slightly above ground level. Eight to 12 inches from the base of the plant create a 2-inch-high rim of soil to prevent water runoff. Water soil until it settles, and add more soil if necessary. Finish by applying a 1-to-2-inch layer of mulch. For container planting, use an azalea and camellia mix as your potting soil. Regular watering is essential. Never let the soil dry out. Keep the soil moist but not soggy. This article discuss how to grow your hydrangeas. 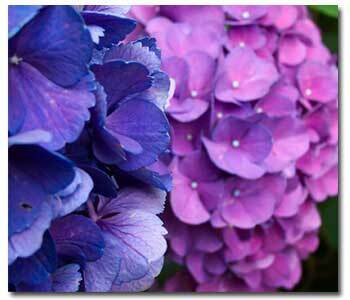 To learn how to alter your hydrangeas colors read How to manipulate the color of hydrangeas.